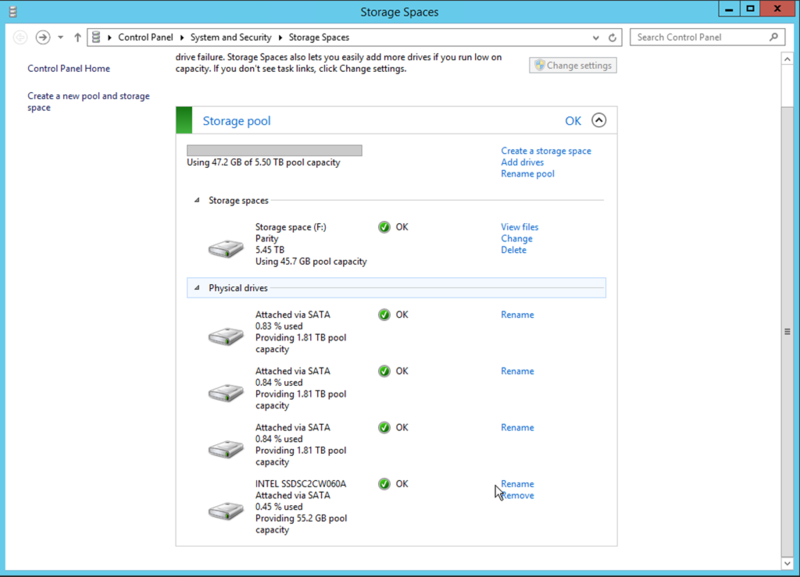 Well, here we go again with another round with Storage Spaces. 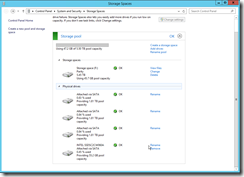 If you have read my other reviews on Storage Spaces, you know that I have not been a fan of past versions, especially in the parity configuration. With promise of new functionality, speed, and security, I was naturally attracted to testing it again. After all, they have has a few attempts prior so this version had to be better than before. Right? I again opted to test the parity configuration for two reasons. First, it is the most efficient configuration that balances between maximum storage and resiliency. Second, I wanted to compare it to all other testing I did so I could compare apples and apples. 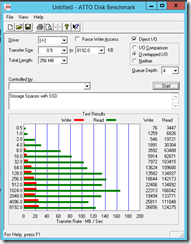 I used a dedicated system with a Core I5-4570S (Haswell) with the same 2T green drives I used in the original testing. 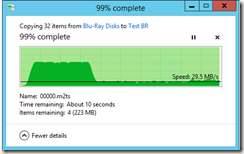 I did a fresh install of Server 2012 Essentials R2 with no other software installed on the system. 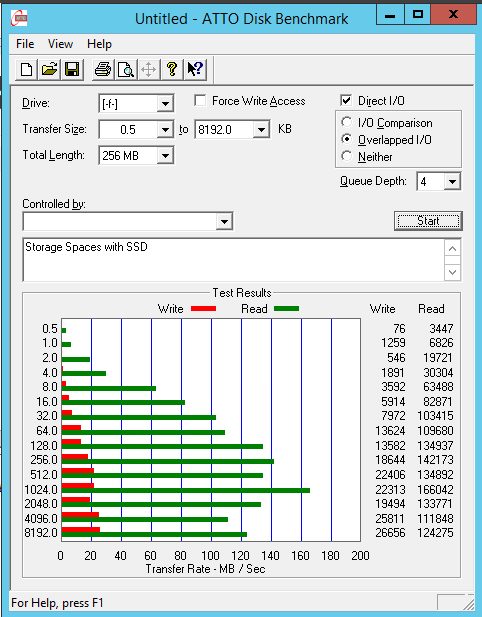 I also used an Intel 60 gig SSD as a potential cache to see what the impact if any there would be. 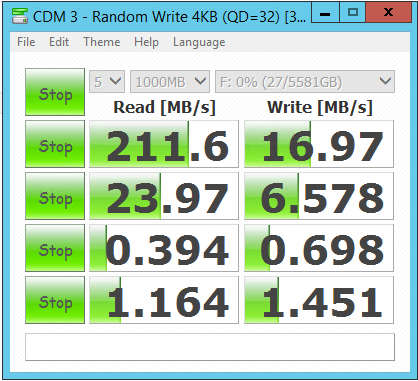 As you can see from the benchmarks, the write speed is terrible and actually worst than before (see previous test). The read performance is still pretty good but no real improvement has been made. In addition, just like before, it seems to use a memory cache when copying large files. 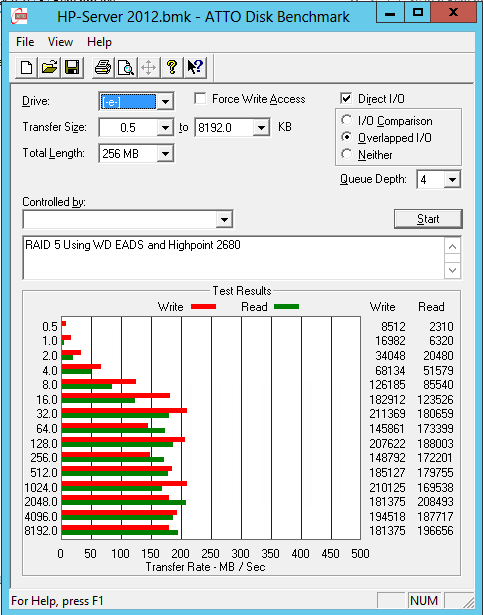 As you can see from the file copy test, it starts great, then tanks to stabilize at the volumes actual write performance which is extremely slow. The time it took to copy was 3-5 times longer depending on the file size. The larger the file, the worst the performance is. For more details on earlier testing, here are several of my prior write ups. 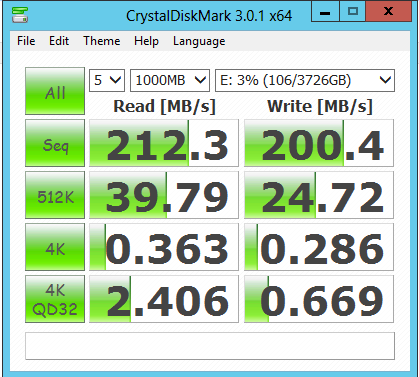 Here are the readings I got from of the earlier writes using an older 2680 card in a RAID 5 with the same drives. 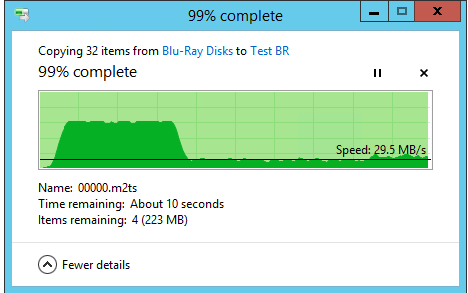 As you can see the file copy is far more consistent and copied about 4-5x faster. 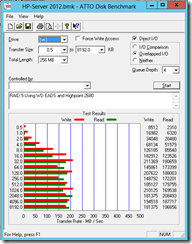 As you can see the benchmarks are quite different and every day use is like night and day. 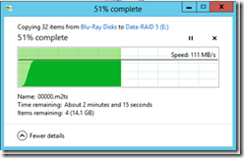 As the new version of 2012 R2 has added SSD caching of sorts (tiered storage), I wanted to see if this version of 2012E R2 would detect or behave differently when adding an SSD like the description of the features implies. I realize that this feature on 2012 has to be setup and configured using power shell, but I thought I would just see what happens if I hooked up an SSD as it is supposed to be SSD aware. I was able to successfully add the drive to the volume but unfortunately out of the box it did absolutely nothing to the performance. My understanding of setting up a volume requires the creation of a new volume and can not be added to an existing array but I figured it would not hurt and was worth a try. What did work was that I was actually able to remove the last drive I added. Do not know if it was because it was an SSD or if they added the feature. 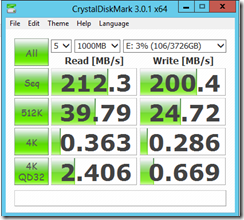 I could not however remove any other drives just the SSD. When all was said and done, this experiment ended up as all the others did, and turned out to be a waste of time on a feature not worth using especially in parity. I still have the same complaints I had before which the inability to figure out which drive is bad (without labeling, renaming etc.) and the overall inflexible nature of the configuration. Obviously in mirroring, it does better but you have to be willing to cut your storage in half which for some people is perfectly fine.